Actinic keratoses, otherwise known as solar keratoses, are the most common pre-malignant skin lesions treated by dermatologists in South Florida. Actinic keratoses (AKs) are scaly reddish or tan lesions on the surface layer of the skin (epidermis) caused by chronic exposure to sunlight, particularly ultraviolet light. They are mainly found on the areas of the body that receive the most exposure to the sun. AKs occur when the cells that comprise 90 percent of the epidermis, the keratinocytes, change their size, shape and/or organization in a process called cutaneous dysplasia. This alters the texture of the skin surface and may extend deeper, into the dermis. What are the symptoms of actinic keratoses? AKs typically manifest as rough or scaly skin, bumps, mottled patterns and cutaneous horns. They may appear anywhere on the skin surface exposed to sunlight, but common areas include the face (including the ears and lips), neck, arms and hands. 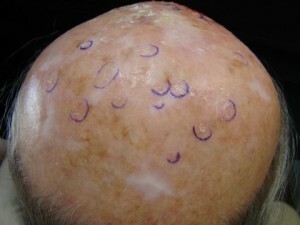 Lesions range in size from a pinpoint to several centimeters in diameter and may be yellow, brown, red or violet in color, and smooth, wrinkled or furrowed in texture. Are actinic keratoses the same as skin cancer? AKs are called “pre-malignant” because they can signal the onset of skin cancer. AKs may develop into squamous cell carcinomas, the second-most common form of epidermal skin cancer. Squamous cell carcinomas are a malignant skin growth that may, if left untreated, spread to other parts of the body and can potentially be fatal. Do actinic keratoses only occur in older people? While AKs most often appear in people aged 40 and above, anyone who has had extended exposure to sunlight, especially if they have pale skin and have not used effective sun-protection during their earlier years, is susceptible to developing them. In sunny areas like here in Florida , teenagers may also be diagnosed with Aks, although they are much more common as we age. Should I see a dermatologist if I have an actinic keratosis? Yes! While AKs can be cosmetically unattractive and symptomatic, it is even more crucial to seek treatment for them because they can develop into the more dangerous squamous cell carcinomas. Yes. A surgical biopsy may be performed to determine whether the lesion has become cancerous. Depending on a number of factors such as the size, location and severity of lesions, as well as the patient’s age, health, medical history, occupation, expectations and preferences, treatment for AKs may take several forms. 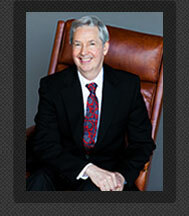 Dr. Kaminester sees many patients with AKs every day. The most common type of treatment is cryosurgery. During this procedure, liquid nitrogen is applied to the skin over the lesion, causing it to crust over and fall off. There are also topical medications, like 5FU (5 fluro-uracil) and imiquimod, which recognize and attack and kill these growths. Clinical experience and expertise is invaluable to use these medications properly to provide the patient with the best results to successfully remove the growth with the least amount of scarring, discoloration or discomfort. Dr. Kaminester will also suggest methods of sun-protection to minimize the development of more of these unsightly and dangerous growths. Once my actinic keratosis has been removed, do I still have to avoid sunlight? Limitation of exposure to direct sunlight is crucial to preventing the recurrence of AKs or squamous cell carcinomas. You should stay out of the sun when it is strongest, use a broad-spectrum (UVA and UVB protection) sunscreen of at least SPF 15 and wear protective clothing such as long-sleeved shirts, sunglasses and wide-brimmed hats. In addition, Dr. Kaminester may prescribe vitamin A medications such as topical retinoids. Yes. People who have had AKs are much more likely to develop new ones, often in the same general area as the earlier lesions because this is where the chronic sun damage occurred. That’s why routine skin examinations every few months are recommended for all of Dr. Kaminester’s patients who have been treated for AKs.